Tuff was Hance's gift from Grandpa Grunden. Hance started with Tuff before weaning by leading, grooming, washing, picking up his feet, and even saddling when Mom and Dad weren't watching. Hance started breaking him as a two year old and we started showing him in 2004. So far Tuff’s major win has been a "Super Horse Award" at a large, open local show. Hance and Tuff are inseparable and he is used to work with cattle on the ranch. 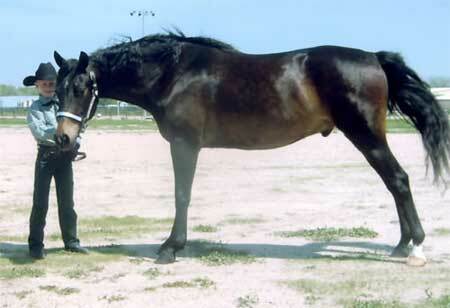 Tuff's dam is RG Orcutt Ambrosia and a half brother to our stallion, RG Rimlo Prince Valiant.